When we are told a story, whether true or fictional, we hear and feel it in the words and body language of the speaker. Yet even as the experience provokes a direct reaction, we may be thinking of how we can share it with others. Except for people with eidetic memory skills, a story is rarely remembered verbatim. Rather, it is verbally and physically paraphrased to fit the recipient and the circumstances of its retelling. Whenever I read last week’s Parashah Yitro and the current Parashah Mispatim, in which Moses receives the Torah on Mt. Sinai, it is difficult not to picture these scenes as portrayed in Cecil B. DeMille’s classic 1954 film of The Ten Commandments. Having seen the film’s premiere as an impressionable child, I barely appreciated the enormous implications of that divine event beyond the ‘silver screen’ until many years later. When the heavenly fireworks that accompany the giving of the Torah terrifies everyone gathered at the base of Mt. Sinai and Moses ascends to the summit to accept it as an intermediary for his people, the idea that Moses was to make this vast trove of information accessible to them in a language and form they could comprehend was stunning. There has been much speculation as to the form of that divine transmission, from questions concerning the original ‘language’ to the method of delivery to the mental and physical qualities that distinguished Moses for this task. Popular writers and university scholars have collaborated and done well promoting the idea of ‘bible codes’, prophetic information encoded in strings of letters. Yet, scintillating as this notion is, solid proof remains elusive. And perhaps it should be, if faith is to flourish in the face of scientific scrutiny. Considering Moses’ pivotal role in this dramatic narrative, a few questions arise. Was Moses chosen for this task because of a natural ability for opening his mind and heart to this divine body of knowledge, or were these qualities acquired from his early experience as a prince of Egypt and subsequent discovery of his true identity as an adult? Perhaps it was a combination of both, but until someone invents time travel, these arguments remain philosophical conjecture. From a slightly different perspective, I like to imagine that Moses’ ability to receive G-d’s transmission is a metaphor of ‘tzimtzum’, G-d’s contraction of His Essence, permitting Creation to occur from the dark void. My logic may be fuzzy, but when Moses becomes instrumental in the creation of the nation of Israel out of a nation of slaves, he seems to mirror that ‘tzimtzum’ on a micro-level. Designing the illustrations to embody these ideas for my book, Between Heaven & Earth: An Illuminated Torah Commentary (Pomegranate, 2009), brought me to a major contextual impasse. 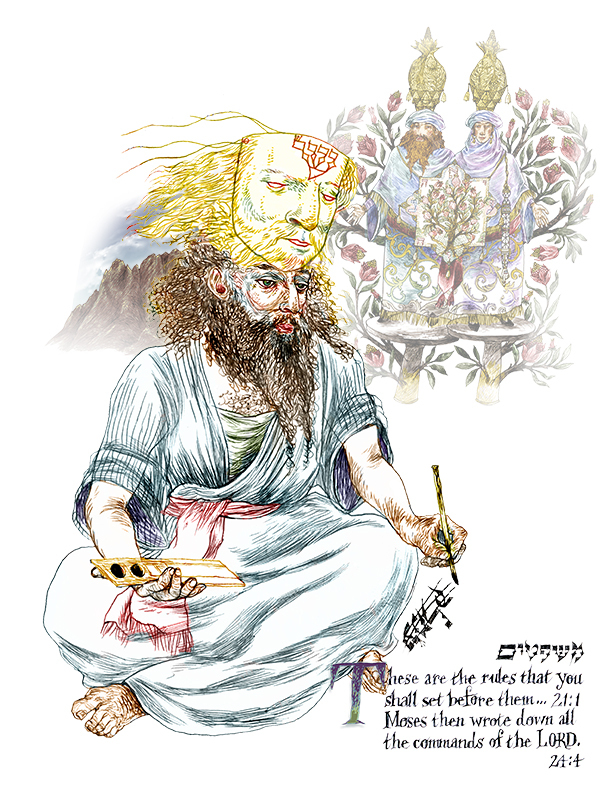 Representing G-d in any form is prohibited in the second commandment, but I intended no offense when I drew upon the kabbalistic idea that Hidden One may only be perceived behind an ethereal mask. I imagined Him emerging from between veils of light and darkness with the intention of letting Himself be known to us, but shielding us from a force that we, in our frail forms could not endure ‘face to face’. Consequently, in the illustration above, I have portrayed Moses as a sofer, a Torah scribe in an intimate conversation with G-d through His Mask*. Wielding a reed pen, Moses is writing the word ‘Amalek’ a great enemy of Israel, then crossing it out three times. This part of the transcription process has since become the traditional first step a Torah scribe takes when beginning to write a new scroll. In this way we are meant to understand our history; to do good and not evil. And now we understand that Moses is also more than just an ‘envelope’, so to speak, for the divine message. As ‘Moshe Rabbeinu’, Moses our teacher, he has becomes a timeless example of how the we and the Torah must become one in both spirit and practice.